Deanwood Campsite, newly opened in 2013, is quietly situated in the picturesque Forest of Dean, an area brimming with wildlife & scenic beauty. Woodland paths border Deanwood Caravan and Campsite where deer are often seen in the early morning and at dusk. Deanwood Campsite prides itself on being a quiet site where our guests can relax, unwind, enjoy the stunning setting of the Forest. Deanwood Caravan and Campsite is a quiet adult only 18+ site situated in the picturesque Forest of Dean, Gloucestershire, an area brimming with wildlife, footpaths, cycle paths and both natural and man-made attractions - yet this corner of England where life ambles on at a leisurely pace is still undiscovered by most. Office Open Mon-Sat 9am-9pm, closed Sundays. Campsite re-opens 22 March 2019. Deanwood Caravan and Campsite prides itself on being a clean, quiet, tranquil site where our adult guests can relax, unwind, enjoy the stunning setting and the sights and sounds of the wildlife in the Forest of Dean. The campsite slopes gently to the west, giving panoramic views across the Lyd Valley and the Forest of Dean to the Black Mountains and the Brecon Beacons beyond. Woodland paths border Deanwood Caravan and Campsite where deer are often seen in the early morning and at dusk. Sometimes the elusive white deer is also spotted by our guests. You may also have the priveledge to observing wild boar, badgers, foxes and many little creatures as they go about their lives. The Forest of Dean is a bird watcher's paradise. The Nags Head RSPB nature reserve is less than 3 miles away, but many different birds have been spotted in the woods adjoining our site including male and female Crossbills, hawfinch, woodpeckers, owls, buzzards etc. To clarify, 'adult only' does not mean nudist!!! but allows you the bliss of escaping from children, delightful and entertaining though they may be, for a little while. Many of the spacious camping pitches are on level ground, in particular the hard standing pitches for motor homes, camper vans and touring caravans, most of which have electric hook up points. The grass camping pitches are spaced out over two fields, Foxglove Field and Bluebell Field. At the far end of Bluebell Field, beyond the pitches, there is a recreation area with football goal where those with spare energy have plenty of space to enjoy themselves without disturbing other guests. Altogether there are 50 pitches, 29 with electric hook up points. A maximum of 40 pitches are let at any one time. Dogs with well-behaved owners are welcome and they are well catered for. They have their own fenced exercise field on site as well as the forest being literally the other side of the fence, with miles and miles of paths and an abundance of interesting smells waiting to be sniffed out! Both of our village pubs are 'dog friendly' as are many other pubs throughout the forest. Please keep your dog on a short lead or tethered whilst on site and pick up your dog's mess immediately, disposing of it in the bins provided. * Modern heated shower blocks, with free hot showers. * Toilet & washroom with facilities for the disabled . * Washing-Up Room with free hot water. * Free use of washing machine. * Free use of tumble dryer. Our facilities are cleaned regularly and kept to a high standard. Although our site is on the edge of the Forest, it is only half a mile away from Yorkley village centre where there are 2 pubs, one of which also serves excellent food, 2 village shops where you can buy fresh provisions, newspapers etc., a hairdressers, Post Office, Doctor's surgery and a Community Centre. The town of Lydney is only 3 miles away where you will find individual shops, supermarkets, restaurants and takeaways, leisure centre, indoor and outdoor (summer only) swimming pools, parks, golf course, fishing lakes etc. There are a wealth of attractions and activities on offer in the Forest of Dean, Gloucestershire, from visiting castles such as Chepstow and Goodrich Casles, and historic houses, to wine tasting and exploring a vineyard or a brewery, kayaking on the River Wye, visiting Symonds Yat Butterfly Zoo and Maze, exploring Puzzlewood where StarWars, Merlin and many others were filmed, hiring a bike for a leisurely ride along traffic-free cycle paths or tackling serious downhill mountain bike trails ... the list is endless! The Forest of Dean, an old mining area, is steeped in history. Discover more about our unique area at the Dean Heritage Centre or underground at Clearwell Caves. Visit Aunt Martha's tea rooms for a truly Victorian experience! In our Reception building you will find tourist information on all the above, plus lots more beside. 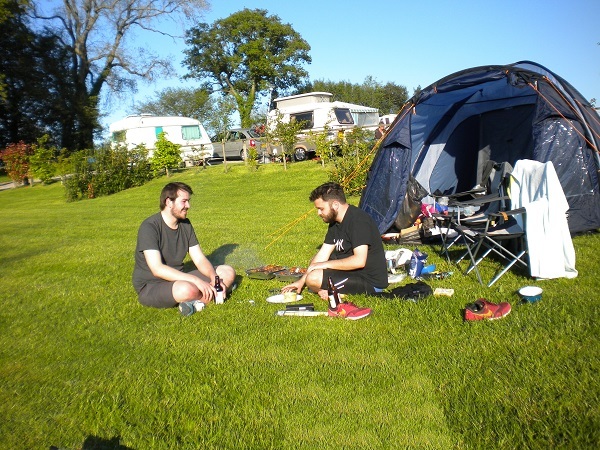 With Deanwood Caravan and Campsite only 3 miles from the A48 and with an asphalt drive leading into the campsite, the campsite is readily accessible for caravans, campervans and motor homes. Stone roads on site allow the caravan and motor home hard standing pitches to be open when the fields are closed. The grass camping fields are normally open from Easter through to the end of September. At Deanwood Caravan and Campsite everything has been thought of to make your holiday experience here one that you will want to repeat.